"Marco? Polo!" turned to "Marco? Y.O.L.O.!" (You Only Live Once) and became an oft-repeated phrase on the trip, thanks to an inspiring InReach "quote-of-the-day" message from Rebecca's brother, Felix. Each of us sought to maximize the experience, to take advantage of every opportunity and just to live each day to the fullest in our own personal ways. A voyage of and through highs, lows, landscapes, people and emotion. On this particular day, Ali and Rebecca just NAILED IT!!! Bluebird day, light packs, perfect snow conditions, great turns and rarified mountain air at 5500m. A great day to be alive and a reminder to YOLO! Snow patch hopping & hot springs. 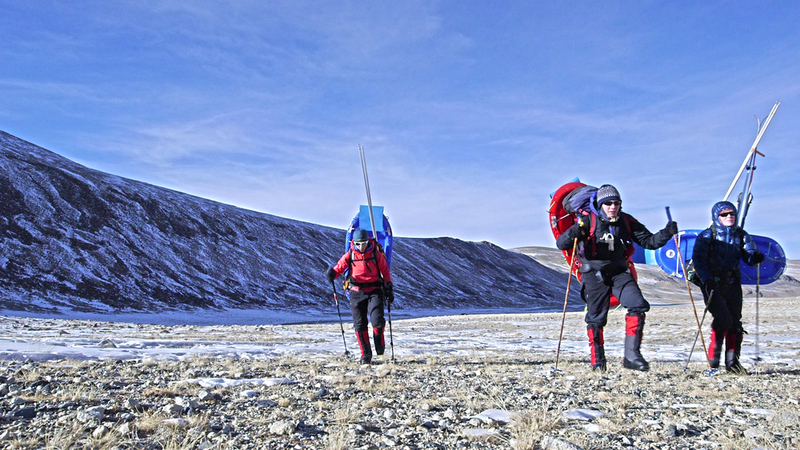 The expedition is underway, and Rebecca, Kate and Ali have already experienced a myriad of snow and weather conditions. Initially, sparse skiable snow and lots of rocks had the team set out on foot, carrying their sleds and gear. 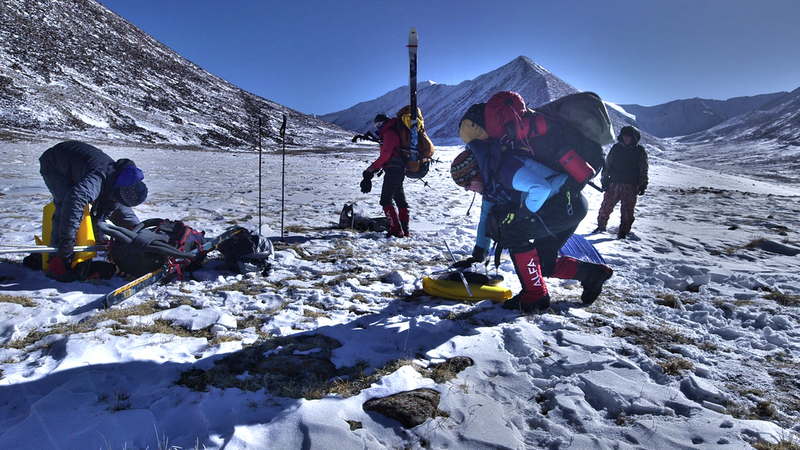 Within a couple days, making slow but steady progress in cold temperatures, the team crossed over a few high passes into the Zorkul valley near the Afghan border. Once in the valley, they relayed that the skiing was sweet, and the border stunning. Most recently, they’ve described favorable skiing conditions, cruising on turquoise ice, and even ice sailing on frozen rivers. Up next, skiing to some remote hot springs - which has the team clearly in very high spirits. The two other members of Borderski in Tajikistan, Lindsay Marie Stewart and Tanya Rosen Michel, have been busy traveling and interviewing local officials and conservation leaders. The whole team was set to rendezvous recently in Jarty Gumbez, however avalanches and hazardous road conditions prevented Lindsay and Tanya from making the trip. They will try to meet up again in the days ahead. The Borderski journey has begun. Arrival in Osh, Kyrgyzstan, was wonderfully undramatic - all skis, sleds and bags arrived unscathed. Taking a few days to organize, nurse jet lag and explore, Ali, Rebecca, Kate and Lindsay met up with teammate Tanya Rosen of conservation partner Panthera. Together they drove a stunningly beautiful route south along the Chinese border to Murghab, and then Alichur, Tajikistan. 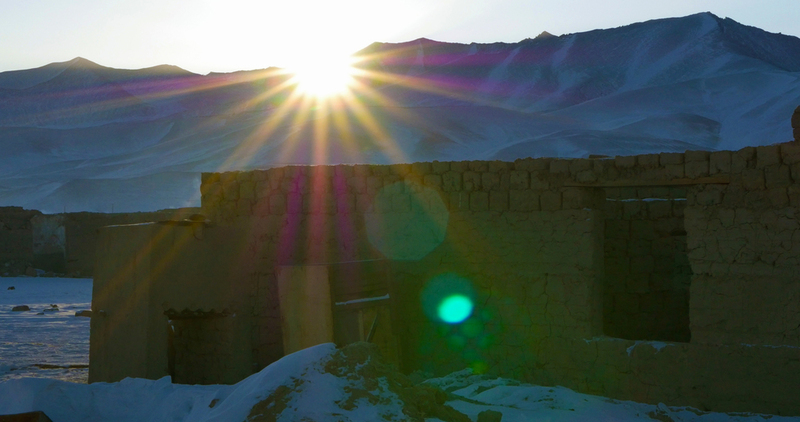 The incredible hospitality of their homestay hosts, as well as their first Marco Polo sheep sightings, have the team more than ready to swap tires for skis and head into the mountains. After years of planning this expedition, Borderski’s self-supported, all-woman ski traverse of the "Roof of the World" is underway. Marco? Polo! Cue lurch of stomach, cue hammering of heart. It's go time. The day is finally here. Kate, Ali, Rebecca and Lindsay start making their way across timezones and innumerable borders before landing in Tajikistan, officially the start of their expedition. It's a long journey to the Pamir Mountains - the "Roof of the World" - from Canada, time passed most likely reading books, striking conversation with seatmates and strangers, and that ever present fluttering of anticipatory butterflies signaling wild adventures ahead. Stay tuned to this website for updates and stories from the field. The goal of this expedition is to document the impact of borders on migratory wildlife, but also to inspire others to think, dream, and act beyond one's own borders - whatever shape that might take. We're ramping up expedition prep for our launch to Tajikistan IN FIVE DAYS (!!!!!) 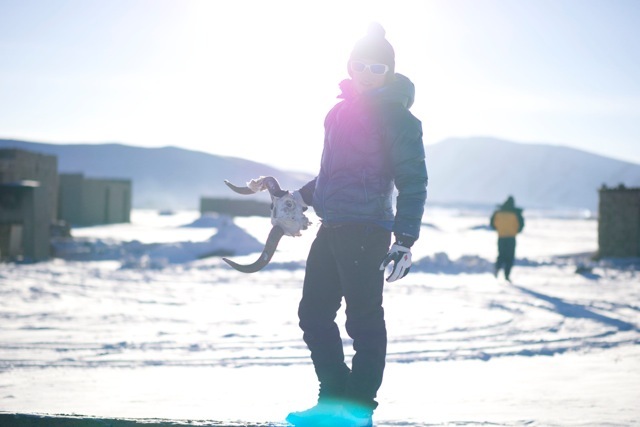 which means everything about life is chaotic right now, but expedition filmmaker Lindsay Marie Stewart still found the time to put together an Instagram profile for Borderski –– enjoy! Kate was interviewed by Outside Magazine about being a modern-day explorer, so Borderski got some buzz! You can read the piece here. Borderski's own Alison Criscitiello was interviewed this week by the Lady Paragons podcast, and discusses her polar work and climbing life - particularly Borderski and the Borderski team's previous expedition in the Indian Himalaya! It's official...the Borderski expedition has won the $10,000 Scott Pearlman Field Award, an Explorers Club grant program in honour of the late Scott Pearlman, a photographer who at 22 became one of the youngest members of The Explorers Club. Sadly, he died of liver failure due to hepatitis C at the age of 38, "still looking for the perfect picture." It's a tremendous privilege to carry his name into the Pamir mountains through Borderski, and we'll strive to do everything we can to make the Pearlmans proud. For more details, check out the news update on the Facebook page for the Scott Pearlman Field Award. That would be Borderski's very own Alison Criscitiello. She's such a rockstar (er, icestar) that MIT's Woods Hole Oceanographic Institution showcased her adventures in science and the high mountains through a short movie and article. Our Pinnacle Peak climb, which Ali fearlessly led, is featured in both! “Sometimes you have to just try things,” Ali says in the article, "even though you have no idea what the outcome is going to be.” Borderski or bust! We are thrilled to learn that Borderski was awarded the Scott Fischer Memorial and Lara-Karena Bitenieks Kellogg Memorial Conservation Grants from The American Alpine Club (AAC). Thank you for the support, AAC!